Sometimes I get a hankering for pâté. Occasionally, this means a trip to the store for some necessary ingredients and a couple of hours of magic in the kitchen, but more often I get lazy and just pick up something at the supermarket. 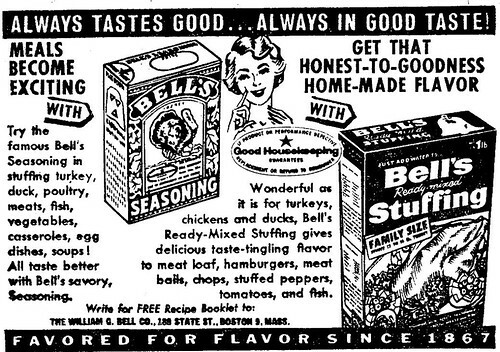 Sell's Liver Pate, made these days by B&G Foods, is one of my favorites. Despite pâté's current reputation as some sort of gourmet canapé nibble, one can hardly describe Sell's as a "gourmet delight" these days, especially when held in comparison to some of the finely-crafted pâtés available refrigerated in many supermarket fresh-foods areas. Snacks for six? Quick, the can-opener. There you are, friends, without more ado. It's a new pâté made of pork livers, of fresh pork, of pork fat, of soup stock, of wheat germ. 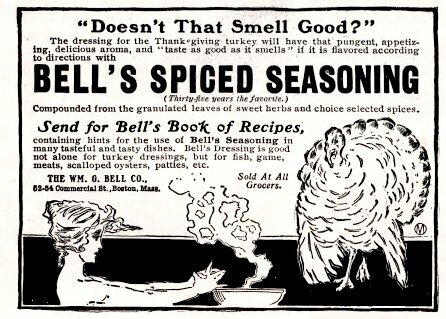 There's dried skim milk in the mixture, and French-fried onions, pulverized to powder, and dried brewer's yeast for its vitamin impact, and seasonings, of course! A tin of six ounces is priced around 17 cents and is selling right now in hundreds of stores in New York City and other cities right across the nation. 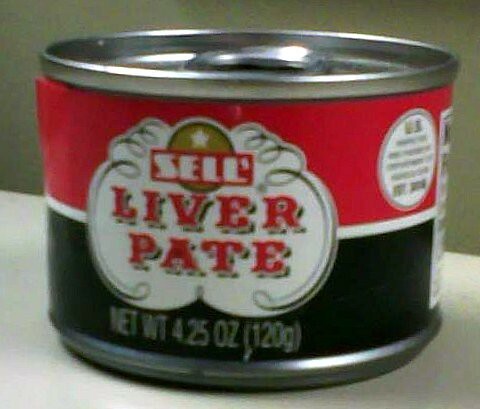 Its name is Sell's Liver Pate, made by Henry B. Sell, of Sell's Planned Foods, 501 Madison. The cans are 4.25 ounces these days, and the ingredient list is shorter (Pork Livers, Pork, Water, Defatted Wheat Germ, Salt, Torula Yeast, Toasted Onion Powder and Spice) but Sell's is still a good, honest liver spread - though at something around $2.25-plus at most supermarkets it isn't quite the bargain it used to be. "Enough of the history lesson," you say. "What about the taste?" Let me describe it as "rugged." A bold livery blast, nicely seasoned but not at all delicate. Right out of the can it's capped with a thin dressing of fat, and there are more tiny fat particles distributed throughout. You'll never mistake it for foie gras, but if you like strong flavors in general and liver in particular, you might find that a tin of Sell's and a handful of decent toasted-sesame flatbread crackers makes an excellent and satisfying lunch. Back in April, I wrote an article about using hand-held grocery scanners at the local Stop & Shop. The scanners seem to be getting more popular - using them often gets the shopper out of the store in less than half the time a traditional checkout takes - and through the busy holiday season, when the supermarkets are crammed with shoppers, I noticed a lot of customers taking advantage of the scanners' convenience and speed. That's a bit easier to read than the tiny print on the side of the box. 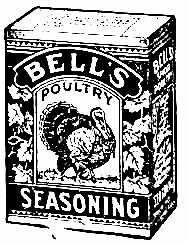 With all the hundreds of new products released every year - and hundreds of others that are discontinued - I find it curiously reassuring to know that some of the brands I use regularly in my kitchen are a hundred or more years old. 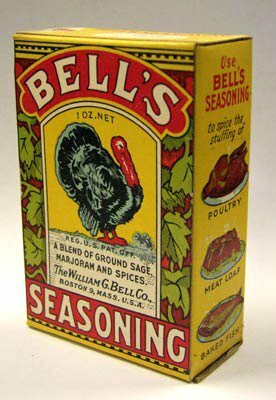 My great-great-grandmother would be baffled by some of the stuff in my pantry - Kraft Macaroni and Cheese, Cup Noodles, concentrated soup base, aerosol cheese - but she would recognize that little one-ounce box of Bell's Seasoning in a heartbeat. Since When Are Pecans Red? 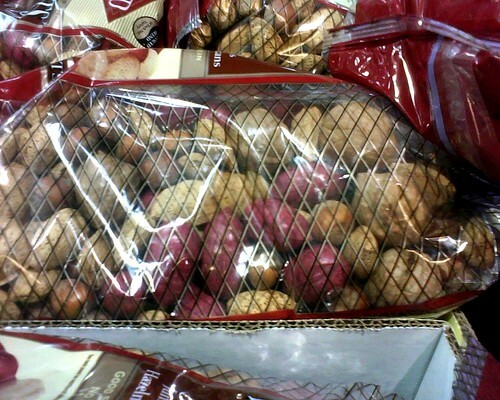 This is a bag of Diamond mixed nuts; I snapped the photo in Costco yesterday. There are two things wrong with this mixture: it doesn't have any Brazil nuts, and the pecans are red. Well, not "red" exactly, but magenta. A really fake-looking obvious dye job. 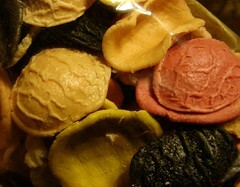 As the ingredients state: "pecan shells colored with artificial color FD&C red 3." What the hell? What possible reason would there be for dying pecan shells? Screw Diamond - the only reason they're soaking pecans in carcinogens is to make them "look pretty." I'm buying my nuts from someone else. 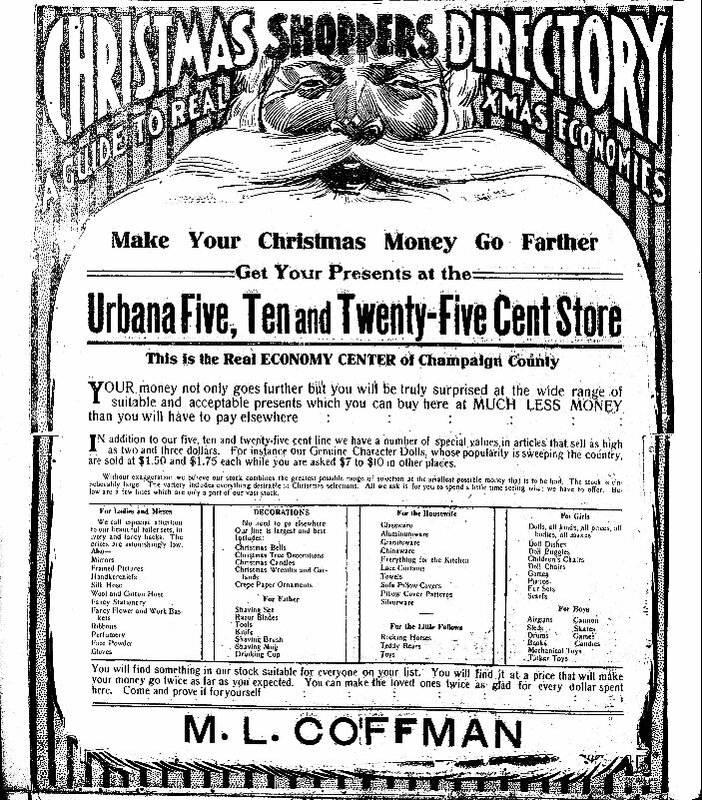 "Make your Christmas money go farther." Sounds a lot like a modern Walmart slogan, doesn't it? See that meat there on the right? Those are short ribs of beef. They're twice the length of the squat little cuts the big supermarket chains in town sell. They're well-marbled, too, but not ultra-fatty like the supermarket ones so often are. 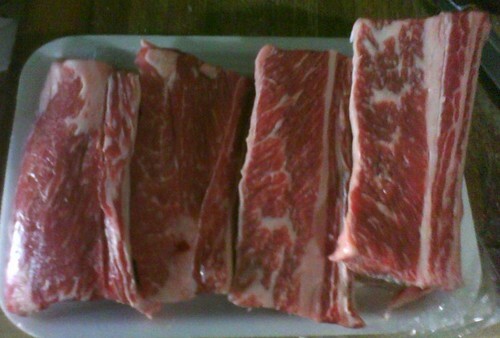 These are beef short ribs like you might have gotten at the local butcher shop forty years ago. That should come as no surprise though, because they are from the local butcher shop. Right up the street from me, there's a little corner store called Caronna's Market. They've been in business in Thompsonville CT for more than 90 years and the place is still owned and operated by the Caronna family who founded it generations ago. My family tries to buy as much of our meats and deli products as possible at Caronna's. It's where I turn to for special orders (like my lamb tongues) and the only place around I can trust for ground beef pure and wholesome enough to eat raw if I ever wanted to: Caronna's doesn't buy industrial chubs of pre-processed factory-made ground beef, they grind their own right there - to order if you want - just like they have for 90 years. Times are tough for them right now. The economy is still pretty lousy around here and my town has three big chain supermarkets plus a Costco available to price-conscious shoppers, with an Aldi coming soon. Caronna's often will compete on price, but they truly shine for quality and service. Like those gorgeous short ribs for example, or the way I can order just about anything I need from them and it will be ready for me to pick up within a couple days. Chances are, you've got a small shop or two in your town. They know that they have to offer you a better product and better service to attract your business, and most of them are hard at work doing just that. Now, more than ever, small mom-and-pop operations need your help. In return, you're likely to get quality and service that the big boys can't hope to match. I love fruitcake. Candied fruit, nuts, pound cake batter. The stuff's awesome, and I don't understand what the big deal is about hating it. Yes, it's sweet and heavy. That's why it's served in small slices, y'know? Anyway, I'm considering setting up a kind of Fruitcake Rescue organization. 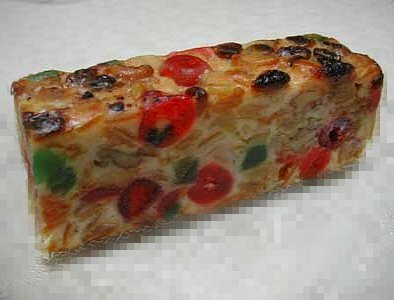 Fruitcake haters could send me the ones they get as gifts and I'd match each delicious fruity brick with a Forever Home. In this context, "forever" would be defined as "hungry fruitcake lover." Even though I don't much care for Oscar Mayer wieners, I've always thought the Wienermobiles were pretty cool. The first one was was built in 1936 as an open-canopy roadster by the General Body Company of Chicago, and Oscar Mayer (now owned by Kraft Foods) has made sure they've been updated every so often ever since. The newest ones are being built on Mini Cooper frames. 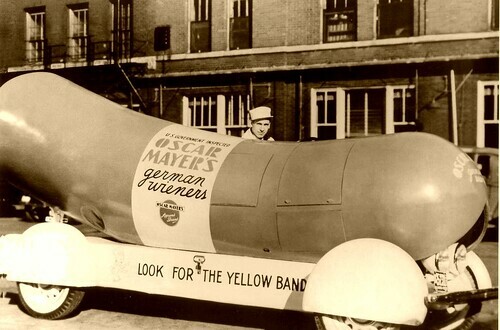 As strange as a gigantic ambulatory hot dog may seem, however, bizarre "mascot vehicles" were already old hat by the time the first Wienermobile hit the street. 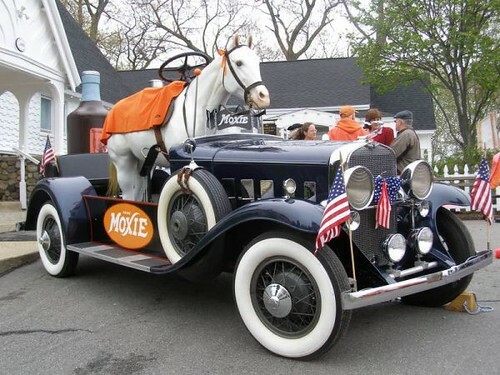 Soft drink manufacturer Moxie had been building "Moxie Mobiles" since the advent of the automobile. They were usually a carved horse mounted on the chassis of an automobile, with the steering, throttle, and brake controls extended up through the neck of the horse so the driver could reach them. It was, I guess, a dry way of mocking "horseless carriages." This kind of joke is why the rest of the country thinks we don't have a sense of humor in New England. The Moxie Mobile above is still extant and occasionally appears in parades. It's built on a 1929 LaSalle chassis. One of my favorite places to shop is a small New England chain of salvage stores calloed Ocean State Job Lot. True to their name, they carry a lot of closeouts and and bankruptcy lots, but over the years they've evolved into much more than a simple "job lot" store. They're pretty good at spotting open niches in the market and exploiting them. Take, for example, art supplies. For the past few years they've carried decent-quality canvas, paper, paints, sketchbooks, and so on at a relatively low price. It's the same way with foods. Like many job lot stores, they carry manufacturer's closeouts and remainders and items from store bankruptcy auctions. 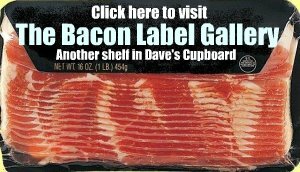 But Ocean State Job Lot can be relied upon for specialty foods that might surprise you. For example, they carry a huge assortment of Bob's Red Mill Natural Foods products - one of the best selections anywhere - for much less than most "natural food" stores charge. And so it is with pasta. Pasta is made in a bogglingly huge variety of shapes. Most supermarkets don't have room for an eighth of what's available, so most people are only familiar with a few common types. Ocean State Job Lot brings in an unusual variety of imported pastas, many of them made by DeCecco, a leading Italian manufacturer. Along with the typical spaghetti and linguini types that you'd expect to find, though, Ocean State sells others that are less typical and offer some variety in shape and texture. And different kinds of pasta were designed with different sauces in mind, too. Candele - These are eighteen-inch long pasta tubes that resemble candles. 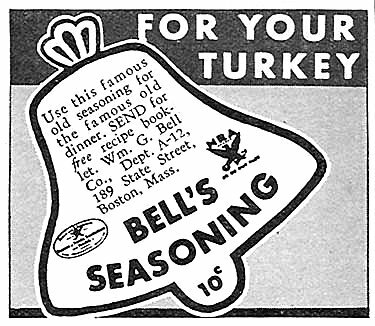 The first time I bought them, it was because they were so improbable and amusing to look at, and I wasn't really sure how I was going to cook them - whole? busticated? WAT DO?? Turns out you just break them roughly as you put them into the cooking water; the smooth tubular shape and the random edges are good with the kind of chunky meat sauces I grew up with. 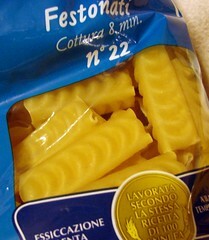 Festonati - Tubes again, this time three-sided and embossed with scalloped ridges (festonati means "scalloped" in Italian.) This has quickly become one of my family's favorite shapes. The scalloped sides give it an interesting initial mouthfeel, kind of like a potsticker dumpling (which the scallops make it resemble. A little.) Those scallops also grab and hold on to sauces, and seem perfect with "slippery" sorts of veggies, like roasted eggplant and bell pepper, as well as with braised meats. Pasta Misti (mixed pasta) - I joked with my wife about how the factory sweeps up all the broken bits from the floor and puts them in bags as mixed lots, but that's what pasta misti reminds me of. There are all sorts of little tubes, wavy bits, curls, and so on. Most of them really do look like broken pieces salvaged from under conveyor belts and off to the side of the packaging line. But they're very useful for soups and they make a decent base for homemade mac-and-cheese or tuna wiggle. Fogile d'Oliva (olive leaves) - A kind of spinach pasta made to resemble leaves from an olive tree. The unusual shape makes it fun to eat, and like other spinach pastas it's good with cream sauces or pesto. 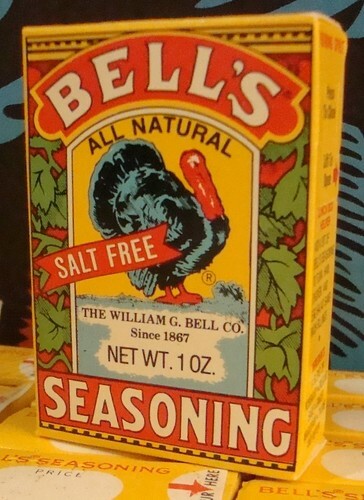 I've seen it for sale in "gourmet shops" and online for $10 or more for a half-kilo bag (a little over a pound.) The Ocean State price for the same size: $2.00. Orecchiette (little ears) - Round, shallow "cups" of pasta, often smooth on one side and textured from the manufacturing process of the other. This particular brand - Castellana - are made in a rainbow of colors provided by vegetable ingredients and are labeled as "arcobaleno" (rainbows) in honor of, I guess, the color instead of the shape. Usually orecchiette are great with chunky meat or veggie sauces, but the colors make these more interesting for pasta salad. Bombardoni rigati - This was another shape that I originally bought more for the lulz than for practical cooking. They're huge rigati tubes, about an inch and a half in diameter, diagonally-cut on the ends like penne. I like it in baked casseroles. If you don't mind spending a little extra time, you can pre-cook them, pipe some ricotta into them, and bake them like manicotti. Because I'm buying this stuff at a job lot store, it's costing me a fraction of what I'd have to pay at a specialty grocer. And the pastas are just the tip of the iceberg for Ocean State. If you live in Southern New England, you really should check them out, if only for the food. Ocean State Job Lot's home page. An online glossary of pasta types, brought to you by The Nibble. 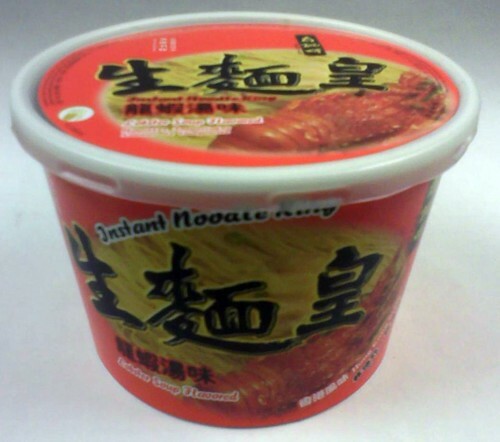 Another Instant Noodle King selection; I like this brand because the extra-thin noodles don't get soggy or limp when the ramen cup is prepared, they stay firm and toothsome. 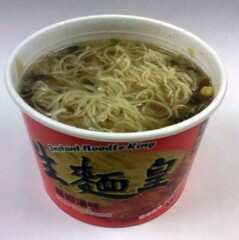 Like most cup ramens, the only preparation involves adding the contents of a few packets to the noodles, pouring in boiling water, and waiting for three minutes. Pretty good, with cabbage, wakama, corn, and rings of green scallion tops. Could have been a bit more corn. The dry soup base packet was outstanding, turning the water into a delicious lobstery-flavored broth The oil packet - which also contained some spices - surprised me because it was studded with tiny bits of onion or shallot, and gave the soup a richer flavor and body than plain ramen. This isn't advertised as a spicy ramen. Very cool indeed. Wish I could tell you how delicious (or, you know, not) it was, but at $13.50 it cost more than the real thing, so it went right back into the freezer after I snapped this shot. When I was growing up, Christmas time was cookie time. 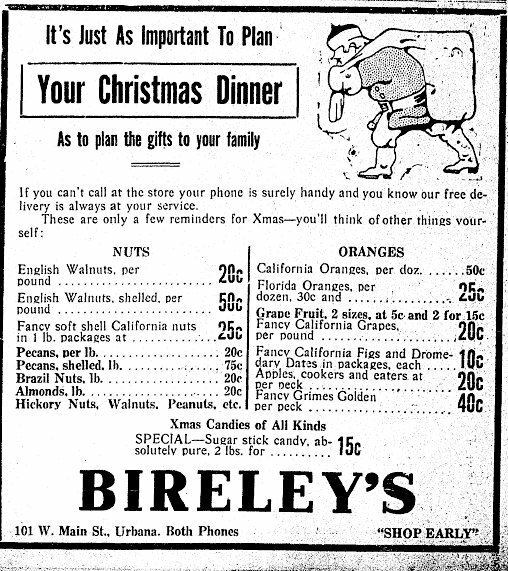 My mom would spend about two weeks prior to the holiday baking up a storm - everything from sugar cookies to Russian tea cakes (or, as she called them, "butterballs.") 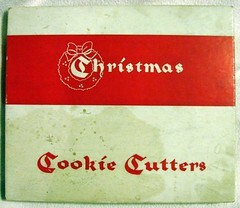 Our favorites were her sugar cookies; she had a huge variety of cutters she used to use for them, some of them the old Mirro aluminum cutters you can still find at flea markets and rummage sales, and some of them made of red or green plastic. As time went on some of the cookie cutters got lost, some got broken, and some she sold off at tag sales of her own as we grew up, moved out, and gave her less of a reason for baking sugar cookies. 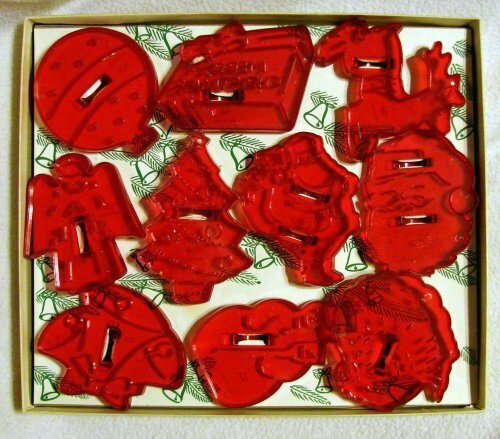 I was always nostalgic for those cool plastic cookie cutters, though, and the great shapes that they would make - a wrapped Christmas present, two different Santa Claus figures, reindeer and so on - and I was thrilled when I found a complete set of them in really great shape - and in the original (well-used and slightly stained) box! Made in the 1950's by HRM Educational Products of New York City, these red plastic cutters have withstood time and use pretty well. Some of them have some stress lines in them, but there are no cracks or splits and I drag them out every year for at least a couple of batches of cookies for old times sake. After all, there's nothing like sugar cookies and a mug of hot cocoa on a cold December evening. I know I haven't been around much for the past couple of weeks. I've had, back to back, two ailments which are perhaps two of the worst conditions a food blogger can get: An abscessed tooth followed immediately by a case of gastroenteritis. I'll spare you the disgusting details other than to say I wasn't able to really chew on anything Thanksgiving Week (though I graciously made a full traditional Thanksgiving dinner for my family, featuring a delcious smoked turkey) and then a couple of days later - after the swelling had subsided - I found I preferred not to actually eat anything. Things are slowly getting back to normal now. The dentist says I'll probably need a root canal on that molar, and the doctor tells me that sticking to jello and soup will get my guts back in order in another day or so. I've got some posts lined up and ready, starting with tomorrow's Vintage Sunday. So, see ya soon. PS. I stumbled upon a pretty decent treatment for dental pain when the dentist is closed for a four-day holiday weekend. It's called the "OL Program." TylenOL, AmbesOL, and alcohOL. Apply the first two as directed, and the last one as needed. Works like a charm.